Do you need an Introduction sales letter for the new company to a broad audience? 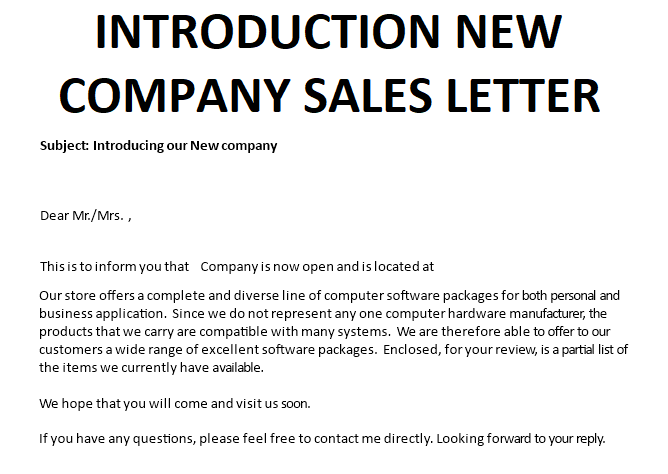 We provide a perfectly drafted Introducing our New company sales letter template that suits your needs! Download this Introducing New company Sales letter template now! The way you present yourself is important and should always get your utmost attention. Introducing a New company can be seen as a Sales or Business development activity. By communicating in a professional manner will get you respect for your work, which will bring you and your company further in life. By using our professional sales letter introduction of a new company, you will have a solid ground and can use the time you saved to put extra attention on the details and to focus on what really matters! We support you by providing this Introducing our New company template and you will see you will save time and increase your effectiveness. This comes with the benefit you will be inspired and motivated to finish the job. Therefore we invite you to check out and download our this sales letter template, which is attractive and intuitive. After downloading and filling in the blanks, you can customize every detail, typography, font size, and appearance of your sales letter and finish in minutes. Using our business templates guarantees you will save time, cost and efforts and helps you to grow your business by doing more sales! Download this attractive Introducing sales letter template for a New company now! For more? Just search on our website and have instant access to thousands of free and premium legal agreements, business documents, forms, letters, reports, plans, resumes templates used by professionals in your industry. All business templates are easy and quick to find, crafted by professionals, wisely structured, ready-made and intuitive.